Can prevent oral hematomas, especially in children and special needs patients. Great for patients who are uncomfortable with the feeling of numbness, or who need normal sensation returned quickly. 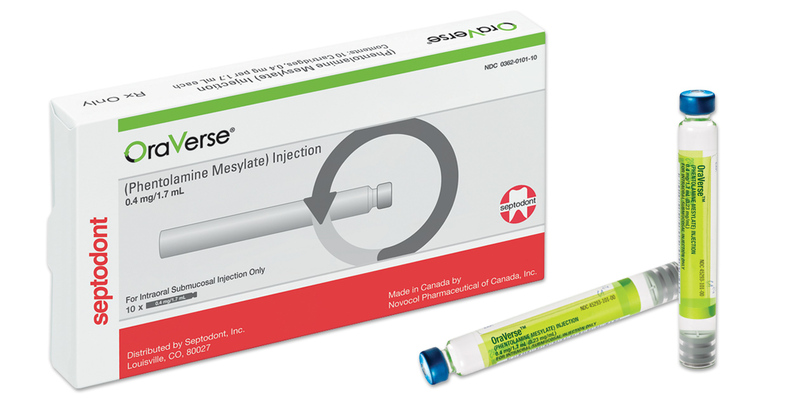 Important safety information: In clinical trials, the most common adverse events with OraVerse (phentolamine mesylate) vs. control were post procedural pain (6% vs. 6%), injection site pain (5% vs. 4%), tachycardia (5% vs. 6%), bradycardia (2% vs. 0.3%) and headache (3% vs. 4%). Following parenteral use of phentolamine in non-dental indications, myocardial infarction and cerebrovascular spasm and occlusion have been reported, usually in association with marked hypotensive episodes producing shock-like states. Although such effects are uncommon with OraVerse, clinicians should be alert to the signs and symptoms of tachycardia and cardiac arrhythmias, particularly in patients with a history of cardiovascular disease, as these symptoms may occur with the use of phentolamine or other alpha-adrenergic blocking agents. 1Hersh EV, Moore PA, Papas AS, and colleagues. Reversal of soft-tissue anesthesia with phentolamine mesylate in adolescents and adults. JADA 2008;139(8):1080-1093. © 2008 American Dental Association. All rights reserved.